Your adventure starts in Anchorage, the state’s largest city and a thriving metropolis with a rich arts and culture scene, hiking and biking trails, fine dining and shopping. 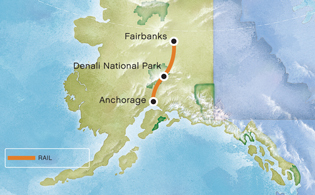 Next, head north aboard a luxury railcar into the beautiful and rugged interior of Alaska before arriving at Denali National Park and Preserve, home to the highest peak in North America, Denali. Spend three days and two nights exploring some of the six million acres of wilderness in this spectacular national park, including a Tundra Wilderness Tour, potential wildlife sightings and hopefully a view of the enormous (and sometimes elusive) snow-covered Denali. Enjoy dinner and a show at the Music of Denali Dinner Theater at McKinley Chalet Resort featuring family-style dining and a spirited original musical about the first men to reach the summit of Denali. This tour concludes in the Golden Heart City of Fairbanks and showcases the best of Alaska’s Interior wilderness. We will greet you at Ted Stevens Anchorage International Airport and transport you to your hotel. Once you’ve had a chance to settle in, spend the evening exploring Anchorage. Enjoy local king crab, salmon or other local fare at a downtown restaurant, stroll along the Tony Knowles Coastal Trail under the midnight sun, or see world-class entertainment at the Alaska Center for the Performing Arts. From a thriving art scene to fresh cuisine and outdoor activities, Anchorage has something for every traveler. Overnight in Anchorage. Experience Alaska's largest city before you board a motor coach and enjoy a scenic drive down Turnagain Arm to Portage Lake. One of the most beautiful highways in the country, the Seward Highway along Turnagain Arm offers stunning views of the sparkling waters of Cook Inlet and surrounding mountains. Watch for Dall sheep on the rocky cliffs alongside the highway and beluga whales in the inlet. At Portage Lake, board the mv Ptarmigan for a memorable cruise that will take you within 300 yards of the actively calving Portage Glacier. Afterwards, visit the Alaska Wildlife Conservation Center before returning to Anchorage. Travel to Denali National Park aboard a luxurious glass-domed railcar. Enjoy beautiful views as you travel into the rugged interior of Alaska. After arriving at the Denali park entrance, you will transfer to your hotel and spend the rest of the day learning more about the region. At the Denali Visitor Center, browse the exhibits and discover what makes the six million acres of wilderness in Denali National Park unique. Watch an award-winning film before returning to your hotel and unwinding after a full day. This evening, enjoy an unforgettable dinner experience at Music of Denali Dinner Theater at McKinley Chalet Resort.Overnight at a Denali-area hotel. Venture into the Golden Heart City and explore more of what Fairbanks has to offer before transferring to the airport and waving farewell to the Last Frontier.